A month ago I finished my first German novel, Morton Rhue's Die Welle. It was only the beginning of a process that would take me deep into my second language--which is also the language that I teach. I began learning Germany my sophomore year in college (1990-91) and spent the next five years taking formal German classes, capping my studies in 1996 with a month-long Sommerkurs with Goethe Institüt in Schäbisch Gmünd. After 1996 fatherhood and my duties as an English teacher took me away from German studies. It wasn't until 2008 that I began teaching high school German, twelve years separated from my last German course. It meant that I taught my first year or two of basic, A1 German, feeling like I wasn't far enough ahead of my students. Still, there were no resources in my district for a brush-up course, so I was on my own. I used Deutsche Welle's self-paced guided language program to push my skills into the B2 range of German. This isn't fluency. Level C1 is fluency, and it's quite a reach, especially for someone without a chance to live in Germany for an extended time. Still it got me to the level where I could read and understand 60-80% of a given text. The suggestion that led me to Die Welle, came in a YouTube Video on Dana's Wanted Adventure channel. After describing approaches that I, myself, had tried--movies, courses, pop songs--Dana suggested reading books while listening to the Audiobooks. As a person and as a learner, I am very thorough. I like to take one thing, break it down into tiny parts, and then reteach it to myself (or others) to really get the gist of it. I am also a huge fan of audiobooks. Dana's idea about reading books appealed to my natural learning preferences, so I decided to give it a try--of sorts. On the spur of a moment, I bought Die Welle from a used bookseller on Amazon. I show the 2008 German movie at the beginning of German 2 every year, so I know the plot very well. I hoped this would allow me to focus on learning new German words without getting confused about plot and things like that. I also noticed that the book is written for a young-adult level reader (grade 6-10, it would appear to me) which also gave me hope for a successful read. I tried to read a chapter each day after I got home from school. I'd say I probably averaged about three chapters a week. I would underline words I didn't recognize, then at the end of every chapter, I would update an online Memrise course, adding a level for every chapter I completed. I began reviewing the words before I was done with the book. By the end, I would have looked up almost 500 new German words, or about three new words per page of the book. Today, a month after finishing the book, Memrise tells me that I have learned 304 of the 489 words, and I have 204 of them securely in my long-term memory. I have the Memrise app on both my cell phone and my tablet, and I find myself reviewing the words when I'm waiting for someone or while watching TV at night. I've basically taken time away from checking Facebook and used it to review German words. I'm really optimistic about this. 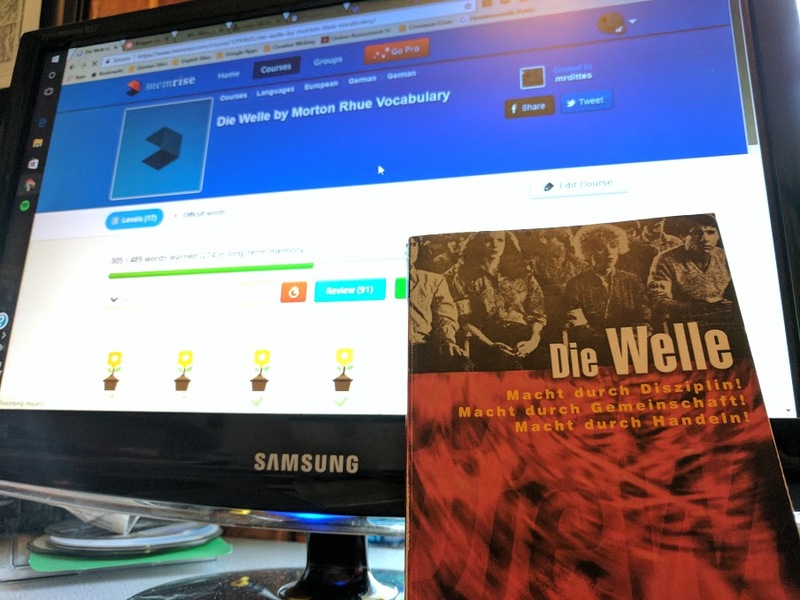 Like English, a lot of German words cross boundaries between verbs, nouns, and adverbs, so learning these 500 words, will open me up to recognizing almost twice as many. I think that if I can really add 500 words to long-term memory, I will have taken a significant step forward. 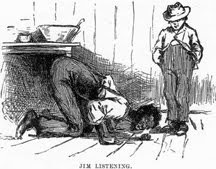 Last Saturday, I read through Max und Moritz, a 19th-century morality tale by Wilhelm Busch that a friend had given me. As before, I underlined the words I didn't recognize and set up a new Memrise course with 99 more words to learn. My next books, suggested by a teacher at my partner school in Germany are Tschick, by Wolfgang Herrndorf, and Momo by Michael Ende. Both of these are available on Audible here in the States, and Tschick was made into a movie a couple years ago. 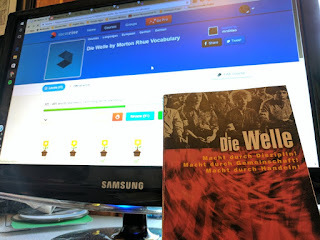 I'm about 60 pages into Tschick at this time--focusing most of my effort on re-learning Die Welle. But I already have a Memrise list started, which I will add to as I make my way through the book.